The decoration of our establishment, Hotel Pastel Paris, was inspired by the elegance of the residents of our borough by taking the codes of famous perfumers and couturiers of brands such as Hermès, Dior or Chanel. 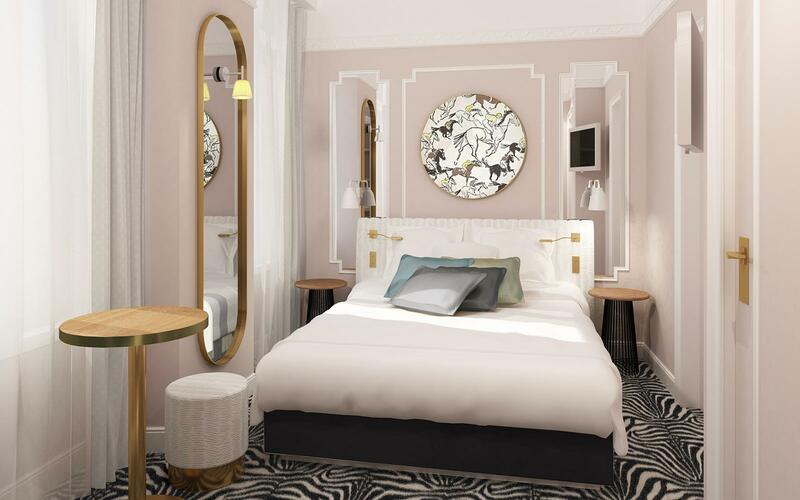 A beautiful jewel in a chic neighborhood, nestled in a small street in the 16th arrondissement, a stone's throw from Place de l'Etoile and Avenue Kléber. A confidential hotel with pastel intonations, powdered, cozy and comfortable. A central circular sofa decorates the lobby, featuring a mosaic pattern with a houndstooth pattern emblazoned with bright flowers. The soft-colored rooms offer all the contemporary comforts of a 3-star boutique hotel. A cozy and intimate Cocoon in which the decoration combines fabrics, velvet and furniture referring to the famous creators. The 5 rooms on the top floor belonging to the Original category have roof windows … Allow you to sleep the head in the stars near the Etoile. All the questions you have about living in Paris will find answers in a relevant way and accompanied by a smile. Welcome home ! We will make your stay unforgettable! Our multilingual team available without interruption, offers you a warm and personalized welcome, as well as tailor-made services. A classic or picturesque restaurant, an unusual temporary exhibition, an unusual museum, a show in Paris ... it advises you and accompanies you with professionalism and conviviality. THE ECO-RESPONSIBLE BREAKFAST "A LA FRANCAISE"
Start the day with a full breakfast! Every morning we welcome you from 7:00 to 10:30, for a generous buffet breakfast. Spacious and contemporary, this is the ideal place to start the day in a gentle way around varied and tasty products. Our desire, To receive you and to see you again in the respect of the sustainable development. Train and sensitize our employees.